I haven't done anything in my art journal for a while, so I wanted to make a new page tonight. Since I've been making backgrounds in the morning before I go to work, I already had the background sprayed and ready to go. It was done with Dylusions spray inks - but since I made it last week, I can't remember the colors! The stamps around the edges are Dylusions and the pretty lady in the middle is from Unity - Ippity - Angie Girl: Dream with Your Heart. I colored in the leaves and flowers roughly with oil pastels. When I make my backgrounds I spray on a plastic sheet so any ink that gets on the edges can easily be swiped up on my stash of tags. 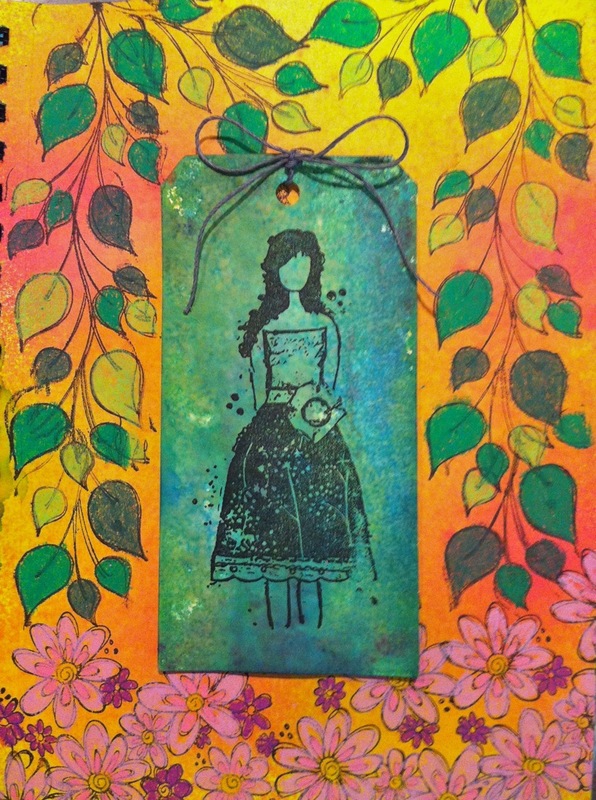 This tag was made from the overspray of inks when I made one of my backgrounds. I have tons of these tags now and they are all so pretty and unique. The twine I used on the tag is from Lawn Fawn. I made the tag from a Tim Holtz Die and an old manila folder. Thanks for taking a look! Great use of the 'leftover' spray... and obviously it's a perfect match! Another gorgeous page, it looks so serene! Love this!!! That Unity stamp image is awesome and your gorgeous background sets it off perfectly! Beautiful! I am just now getting into the journaling and inks and it is sooo much fun. I am just lovin all the great inspiration from artists like yourself.